Robyn Watson from Boggabri Landcare-Rivercare Group was awarded the 2017 Gerald Carnie Memorial Award. The Gerald Carnie Memorial Award for keeping the Landcare flame alive was established by Landcare NSW to recognise Gerald’s very special individual contribution to the Landcare movement. The award is proudly supported by the NSW Parliamentary Friends of Landcare as the official partner and sponsor of the Award. At the award ceremony, part of the 2017 NSW Landcare and Local Land Services Conference in Albury, Landcare NSW Councillor David Walker said: “Gerald Carnie had the Landcare fire in his belly. Gerald spoke about the importance of the spark of individual awareness, ownership and action as being basic to getting uptake of practice change and conservation. “Gerald’s work in Landcare, at the local, regional and State level, was the embodiment of this conviction, and the Gerald Carnie Memorial Award is a testament to people who ensure the persistence and the spread of the Landcare flame. “Robyn really does have ‘fire in the belly’ for Landcare, and is fiercely supportive of the contribution that community Landcare can make to sustainable and resilient farming, to collaborative landscape-scale nature conservation, and to community capacity and cohesion,” said David. 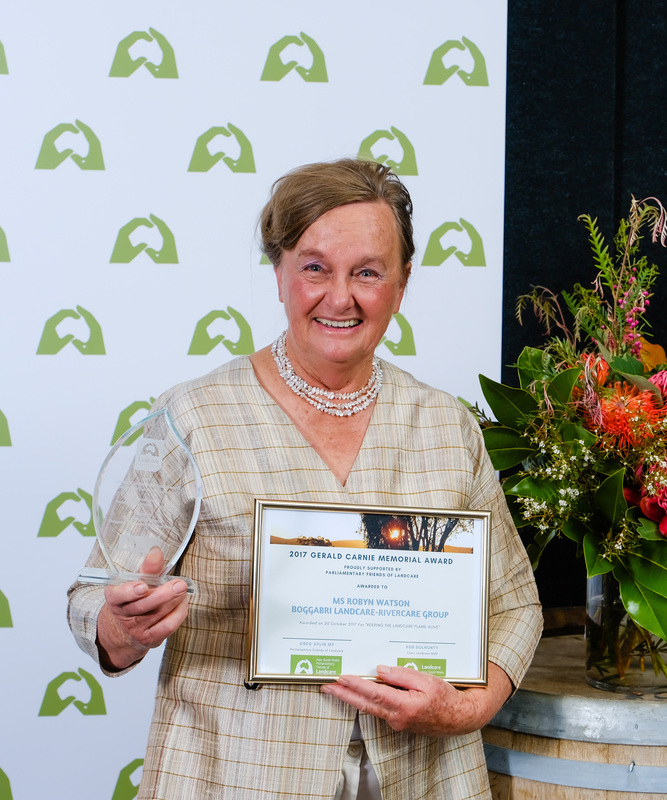 However the attribute that absolutely qualifies Robyn for the Gerald Carnie Memorial Award is her preparedness to fight for what Landcare stands for. Her success arising from sheer persistence. Applicants are judged on the impact they have had at the local AND regional or state scale to ensure that Landcare can prosper. 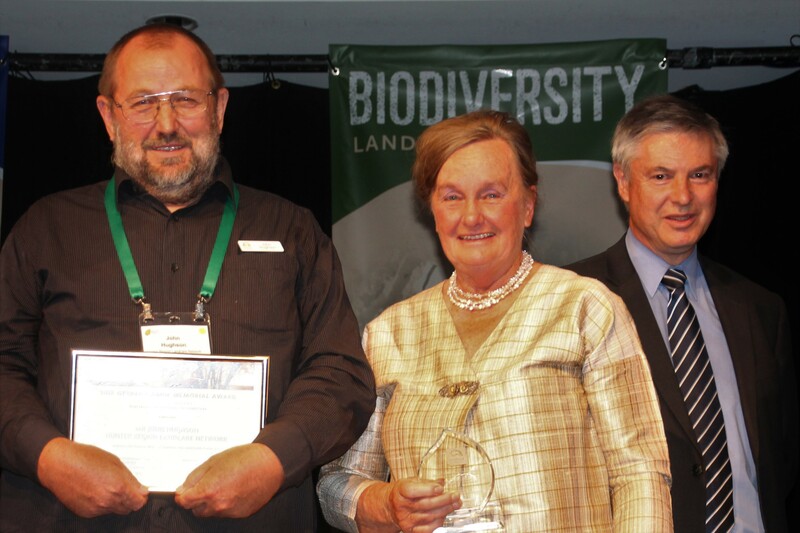 Mr John Hughson– Hunter Region Landcare Network and Robyn Watson – Boggabri Landcare – Rivercare Group. Robyn’s nomination stated: “Robyn was one of the strong voices raised in defence of community Landcare at the Myuna Bay Landcare Gathering in 2007 and encouraged a new generation of passionate Landcarers to man the barricades. David Walker’s speech Gerald Carnie Memorial Award – Albury, October 2017. Greg Aplin’s speech, Parliamentary Friends of Landcare – Albury, October, 2017.